Do Dental Cavities Always Hurt? One of the most common questions we hear, when we first have to give a patient the bad news that they have 1 or more cavities is, “But doc, how come it doesn’t hurt?” It’s a common misconception that a cavity will always give you a toothache. Today yielded another perfect example of this analogy. A young lady was diagnosed as having a cavity, not because it hurt, but because I could see the previous silver amalgam dental filling had broken, and because we could see it on the x-ray, as shown. Looking just at the x-ray, you wouldn’t suspect how deep the cavity really is. In fact, studies show that cavities are usually 30% WORSE than they appear on x-rays, because the human eye can not perceive the grayscale changes at the level they really are. If you’ll follow the progression of photos below (and BTW — this work was done by me, not someone else! 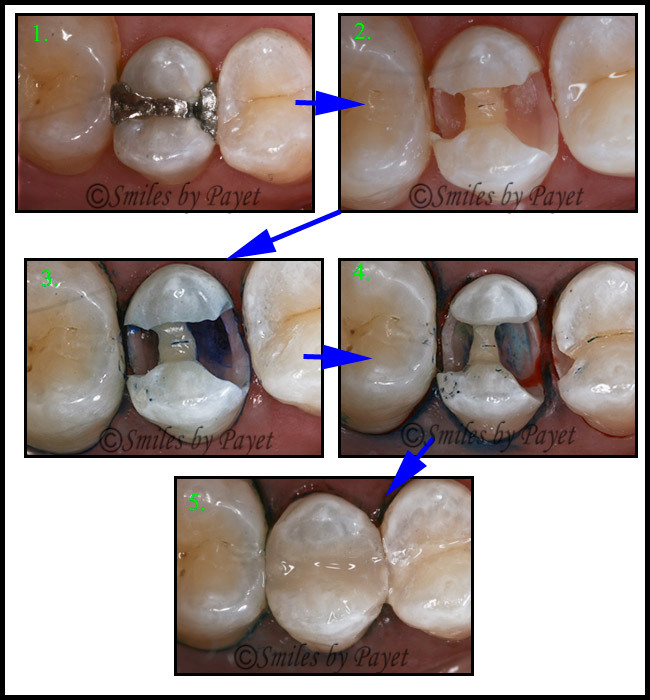 ), you can see where we started with what was a small old filling, then as we progressively and very carefully removed the decay while using 8-12x magnification with a dental operating microscope, to see just how deep the cavity really was. The blue stains are from a solution that we use to help us see where the decay is (it stains the cavity-causing bacteria if there are high enough numbers). Then you can see the finished result: a beautifully natural-looking, tooth-colored composite dental filling. If you are concerned about tooth cavities, Request an Appoint­ment Online or call us at 704–364-7069. We’ll look for­ward to meet­ing you soon!